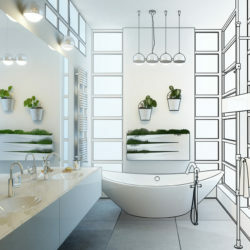 Whether you’re building a new house or renovating your existing home, you’re probably dreaming of a luxurious new space that will contribute to living your best life. Done well, interiors enhance daily living, helping us relax, entertain, enjoy hobbies, raise our families, and even be more efficient. Most people know how they want a room to feel, but they have no idea how to get there. That’s okay. The goal of our custom interior design is to learn about the dreams and goals you have for your space, and make them a reality. The good news is, this isn’t a nebulous process. There’s a structured and proven path to helping you uncover your deepest wants and needs for your new or renovated interiors. We call this the Wise Design Approach, and it’s a process we developed carefully over many years of advocating for our clients as designers and interior design consultants. While other interior design firms may just ask you to bring in a vision board or share pins from Houzz, a picture of a beautiful room can only hint at what will truly fulfill your dreams and needs. An important part of our Wise Design process is identifying your Design Fingerprint. This is how we think of all the elements that make up your design cravings and aversions. It’s how you (or you and your partner) uniquely relate to line, form, color, shape, pattern, space, light, shadow, and more. This is the key to discovering what makes any interior feel wonderful for YOU specifically to spend time in, while we wrap those elements into a finished space that is at once luxurious and livable. Without that discovery process, you could end up with a room that may be beautiful by Houzz standards, but may not be beautiful and deeply fulfilling to you – or fit your idea of ideal daily living and luxury. Ultimately, if a pretty room isn’t functional or meaningful to our client – it’s just another pretty room that won’t translate to improvements in your wellbeing or quality of life. Everything in an interior needs to track back to your unique design fingerprint. We must be able to explain the long or short term benefits of any design choice so that you can make decisions easier. The budget has been worked out in a prudent and respectful manner. It’s none of our business how you arrive at your budget; it absolutely is our responsibly to manage your budget when we steward your project. Here’s a secret: Creating just another me-too room isn’t hard, and it doesn’t require much skill or craft from an interior design consultant or designer. It also doesn’t require much, if any, input from the client. However, strategizing and delivering the spaces that are an expression of what makes you special, what makes you happy, what makes you feel nurtured and secure, is both an art and a science. Not only does our Wise Design strategy take the stress out of the design process, it adds an entirely new level of pleasure and enjoyment for our clients, the very real people and families for whom we design. If you’re eager to transform your home – or a room in your home – into a truly beautiful, fulfilling and functional space, our Wise Design strategy is a no-fail (and pleasurable) way to make your dreams come true. Give us a call today at 215.736.8693 to begin the process of creating the room or home of your dreams.